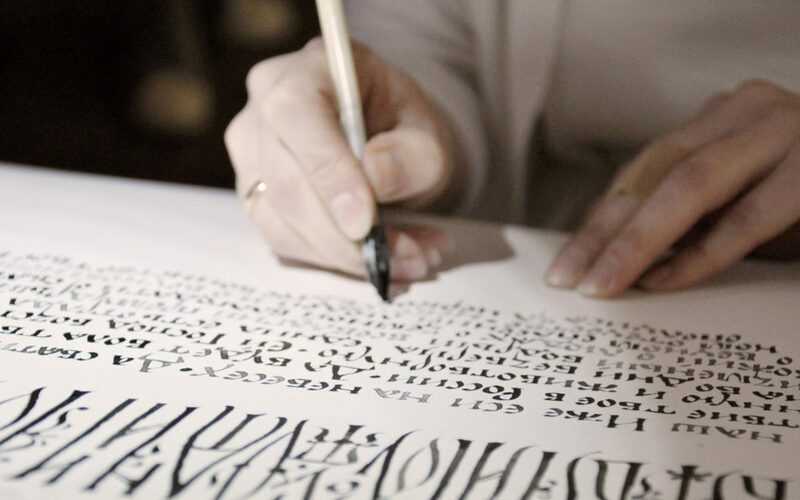 Enjoy his interview with Tatiana Iakovleva, Labora’s calligrapher and the head of the Tallinn School of Calligraphy. Watching Tatiana’s hand move across the page is like watching a graceful dancer in slow motion. Whether she is holding a quill, brush, or pen, Tatiana makes each motion of her fingers – each sweep of her hand – each turn of her wrist – seem effortless … exactly as any talented dancer should. You can only imagine the countless hours of study and of practice, of concentration and of repetition, that she must have dedicated to mastering every one of those individual movements. Tatiana made that immense effort and devoted that immeasurable time because calligraphy has become her magical door “to a world of spiritual harmony and pure beauty.” Only when she enters this world is she able to know – and become – herself. 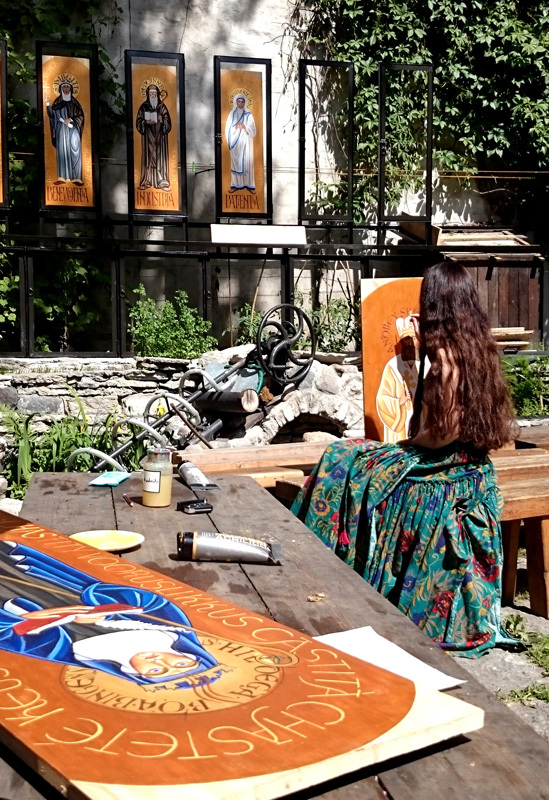 Originally from deepest Siberia, Tatiana is a Tallinn transplant who has taken root here – especially in St. Hildegard’s Courtyard where she helps tend the garden. After growing up in the land of the Finno-Ugric speaking Khanty and Mansi and then moving to St. Petersburg to study at the art school founded by German-Estonian Baron von Stieglitz, her move to Estonia might almost seem organic or perhaps even predestined. Indeed, two things – or two fateful encounters – happened not long after Tatiana arrived in Tallinn: she met her creative mentor and she met her skill master. Mentor Anatoli Ljutjuk – who founded the Ukrainian Cultural Center – welcomed her to his wonderful world which includes Labora’s creative labs. Master Heino Kivihall – who has devoted decades of his life to serving as the Keeper of Estonian Calligraphy – immersed her in the art form known as καλλιγραφία, Greek for “beautiful writing.” Having found both her place and her calling, Tatiana’s talents have been busy growing ever since. Taking William S. Burrough’s maxim “when you stop growing, you start dying” to heart, Tatiana has chosen to grow and grow. Although she still considers herself to be one of Heino’s students, Tatiana has been busy learning new ways of dancing with her hands from other masters. Tatiana even spent several short stints back in St. Petersburg learning Old Slavonic Calligraphy from Pyotr Chobitko and other international masters. Striving for literal perfection, Tatiana never misses a chance to learn something new from anyone who is willing to teach her. For those of us who have enjoyed watching Tatiana thrive and then blossom over the years, it has come as no surprise that this top student has now herself become a master. And just as Heino did before her, Tatiana has now taken on her own apprentices as she develops her own teaching programs and styles. 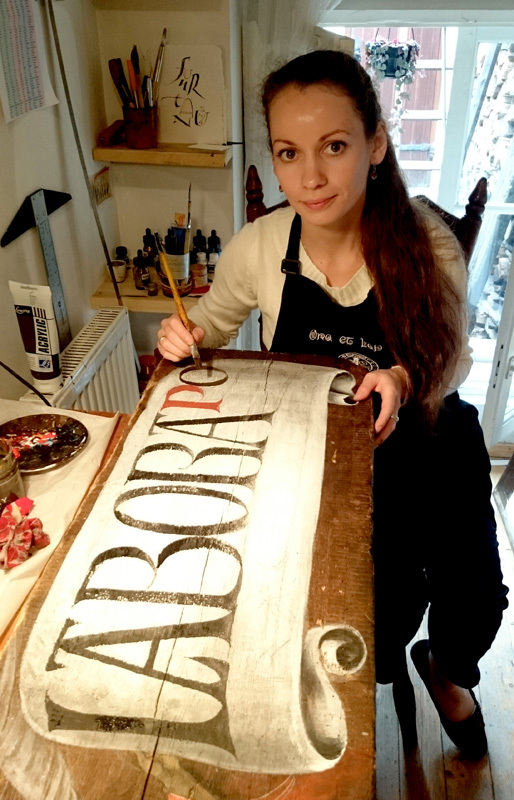 Together with her creative partners at Labora, Tatiana founded the Tallinn School of Calligraphy with the full blessing of her master Heino. If Heino should ever decide to retire, he will do so knowing that – like all true masters – he has passed on everything he knows about his chosen calling onto the next master, onto the next generation. Thanks to Tatiana and her students, the art of beautiful writing is very much alive and well at Labora, nestled within the walls of the Ukrainian Cultural Center, where new hands are learning how to dance old dances with familiar letters. And so, the cycle of art – like the cycle of life – grows on – helped along by a careful touch of μεράκι. 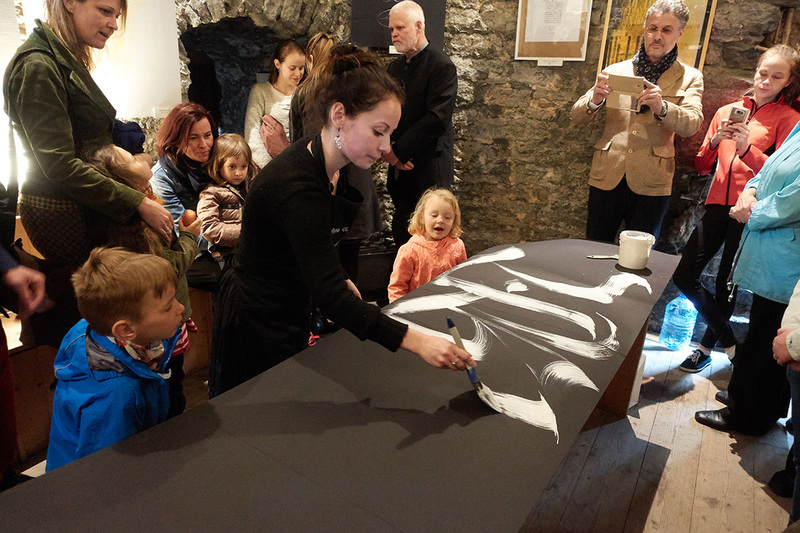 Just recently you brought the calligraphy event known as “A Brush with Silence” to Tallinn’s Museum Night at Niguliste Church. What was that like? Right now, when I think of A Brush with Silence, I feel goosebumps run across my skin – and at the same time, I feel a deep sense of gratitude for having had the chance to experience such peace and unity. 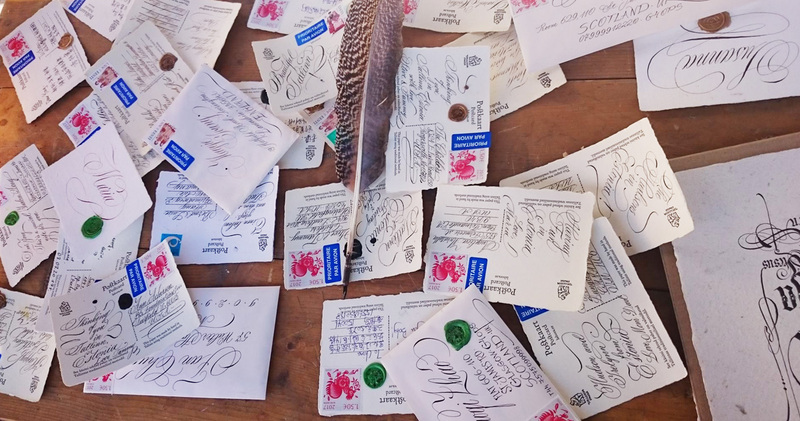 It really was fascinating to see how people from all over the world – gathered around one table – reflected their national spirit through their letters. Their very calligraphy served as a kind of portrait of their people and of their culture – everything was reflected in their handwriting. Once again, I became convinced that every nation has its own unique beauty and immense depth – and yet it is that very beauty and that very depth which unites us all. I was so thrilled that we managed to organize this event and show off this hidden treasure – the multi-faceted beauty of different writing traditions from around the world – to the residents of Tallinn. You’ve taken part in many other calligraphic happenings, creating works both large and small, both white on black as well as white on black – along with various other colors in between. And I’ve seen you use projectors, water, and other tools at these events not normally associated with calligraphy. 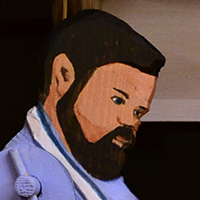 What was your most unusual project? And why? Which one was the hardest to do? And why? And is there one that has stayed with you the longest? And why? After you work for a such a long time within very strict rules and canons, there inevitably comes a time when you want to indulge yourself. So, yes, I did a lot of calligraphic experimenting, writing on just about everything – on water, on trees, on snow, on autumn leaves …. Of course, after this, comes the equally inevitable desire to return to calligraphy’s origins. And yet, enriched by all these different experiences, I can still feel them like waves pushing my creative development forwards. So, let me start with my most unusual project. It was a special calligraphy seminar created together with a family therapist. The task we set ourselves was to help people use the lines of calligraphy to capture the various sensations we experience through our senses of smell, touch, sight, sound, and taste. I found it fascinating to plunge into the world of sensations and then try to capture them on paper. For example, what line – and then what letter – should you use to transmit the ringing of a bell? 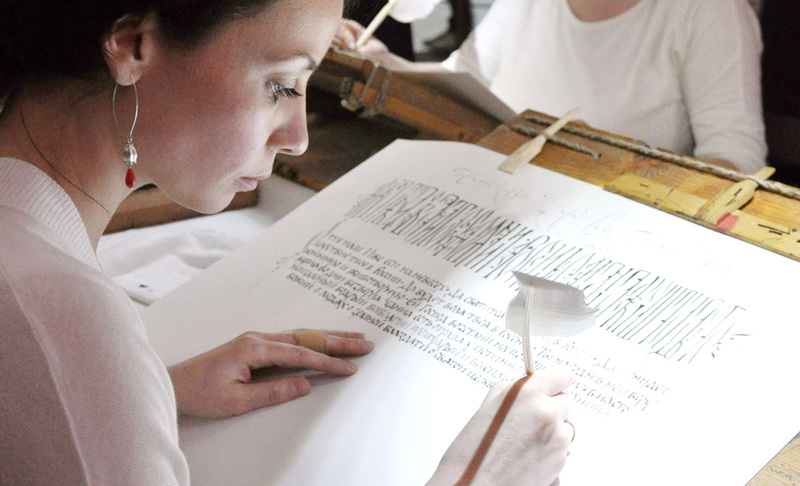 And what calligraphic tool should you use to transfer that particular sound onto paper? Or, what type of line will convey the flavour of an orange? Or the smell of cinnamon? What tool do you choose to relay the sensation you get when touching a sharp object? As we experimented with all this, I found that everything started to make sense – and soon every tool was right within reach – brushes, twigs, plants, multiple brushes, and more. Thanks to this fascinating field experiment, we generated a lot of interesting new calligraphic compositions. And the seminar itself was a huge success, generating a lot of positive feedback from just about all the participants. As for the hardest project, to be honest, I find doing anything for the first time to be a hard thing to do. And since I’m a relative newcomer to the field – especially when compared to someone like my teacher Heino who has been doing calligraphy for decades – there are still a lot of things which I find myself doing for the first time. But in terms of calligraphy works, I would say that my most difficult challenge was the work I did for the Tallinn Town Hall exhibition Art Rules back in 2015. Imagine an exhibition of works by the greatest artists from the 15th to the 17th Centuries – from Durer to Brueghel. And I had to step in among these artistic giants and use my calligraphy to cover the entry wall welcoming visitors to this exhibit. It was a huge responsibility. My task was to create the first illuminated letter – followed by the rest of Plato’s quote about the nature of beauty – which you can track down later if you want. As I was working to a strict deadline, I couldn’t afford to make a single mistake. And yet that feeling of making that first brush stroke on that huge white wall was so exhilarating …. As for the one which has stayed with me the longest, perhaps it’s the one I worked on the longest – in the sense that it involved months of work devoted to a single project. As a rule, time is always limited. It is rare to get enough time to spend on any given work. So, making “The Book of Good” was like being in a calligraphy marathon where you just could not stop. For about four weeks solid, I worked without a day of rest. The work was relentless – but inspiring – as I transcribed stories about goodness in Ukraine. I was so tired while working on that project that when I took a break to rest my hand, I set my alarm. Only this way was I able to finish the book on time. Fortunately, the end result made everything worthwhile. You don’t always work at Labora. Sometimes you venture further afield – from Town Hall Square during Tallinn’s Medieval Days all the way to Narva on the Russian border. Do you have any particularly memorable trips or encounters you could share with us about these journeys? 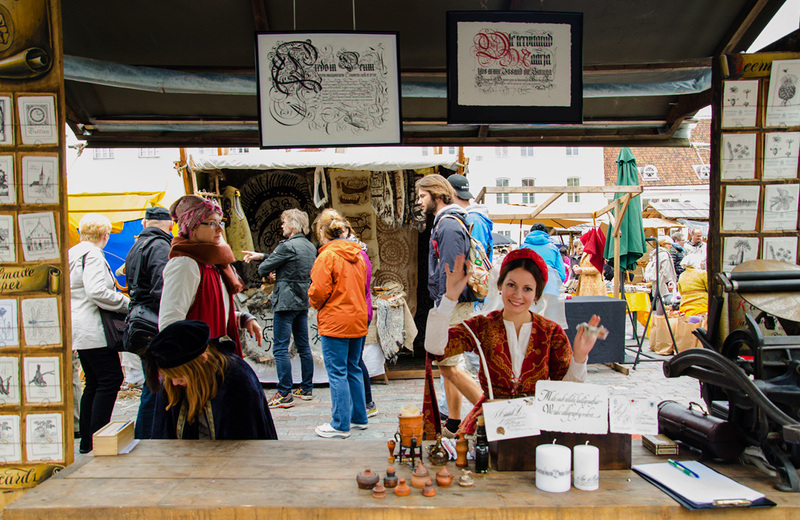 Yes – it’s wonderful to see that interest in calligraphy is growing across Estonia! Fortunately, I’ve had a chance to teach in cities all over the country. In Narva, I was invited to do a small, two-month long course which took place at the local cultural center. While that meant I was exhausted every weekend as I had to get up early to make it to Narva on time before returning home to Tallinn late the same evening, I was also very happy. Fortunately, communicating with the organizers of that class was so easy – and the participants were so grateful and responsive. In Tartu and at Mäetaguse Manor, I taught short, introductory classes on calligraphy. I always love it when I see people’s eyes light up when they see that they too can create something beautiful with their own hands. Tell me a little about your work for Ars Littera here in Tallinn. What does it involve? The annual Ars Littera (Art of the Letter) exhibit serves as a kind of review of everything that we have done over the past year. 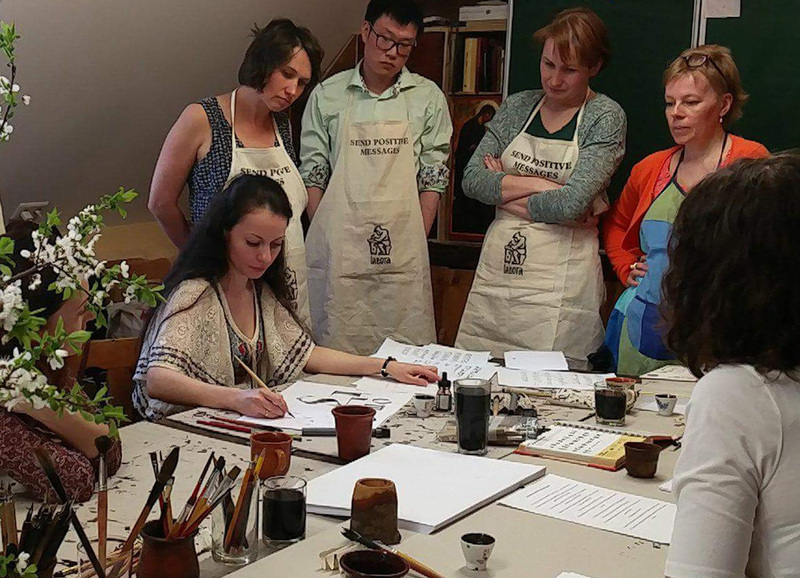 Both students and teachers of the Tallinn School of Calligraphy get to demonstrate their work – all of them beautiful and all of them written by hand. Our goal is to introduce visitors to the variety and beauty of calligraphy using a number of different styles in both the Latin and Old Slavonic scripts. I started organizing Ars Littera not long after I started teaching calligraphy. This year – with Ars Littera 2018 – we will celebrate our fifth anniversary. We hold our exhibit every year at the same time as the St. Petersburg School of Calligraphy holds its annual exhibition known as “Image & Letter.” And so, they send us the best works of their students and teachers and we sent them ours. And while we cross-fertilize, people get a chance to see similar exhibits at the same time in both Tallinn and St. Petersburg. In the future, I hope to establish contacts with calligraphy schools and centers in other neighboring countries and make our exhibition even bigger, richer, and more fertile for all of us. 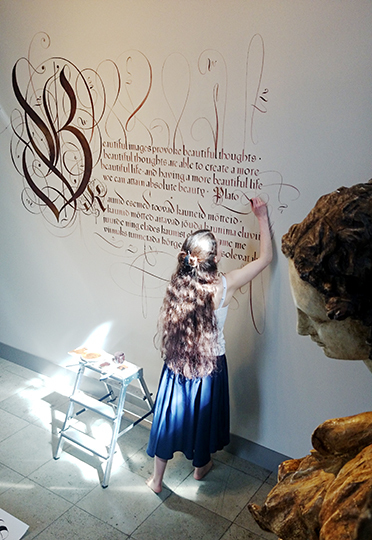 You’re about to open the new Ars Littera calligraphy exhibit in Grusbeke Tower on June 2nd. What will that be like? What can we expect? Who can come? Let me make it easy for you and give you an invitation! Here it is! Tatiana’s portfolio can be viewed here on our website.